It's been a week since I returned from a brief trip to Colorado to visit my family and I'm just getting around to documenting all the fun I had. This trip came about in a round about way. My cousins Liz and Janet were here in April, making the rounds visiting and making a trip to Yankee Stadium, since this is the last year of the old stadium. 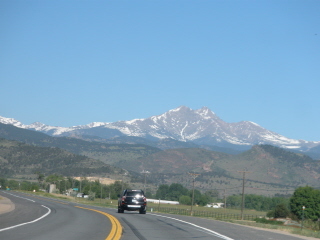 I mentioned that there would be a wool market at Estes Park, Colorado in June and wouldn't be fun to go. Well, that seemed as good a reason as any to take a trip! 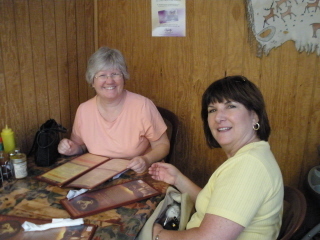 I arrived on a Thursday afternoon and Janet, Liz and I met Linda Marrill for dinner. I'm disappointed that I didn't remember the camera that evening. That is so unlike me! We went to Cracker Barrel, which was fun since we don't have them here on Long Island. On Friday, we met Jeremy and his wife, Jessica, for lunch. Jeremy talked about how it was such a nice day and he'd like to take out his "scooter". 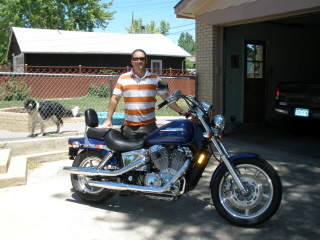 I don't know about you but that looks like a motorcycle to me. During lunch, we talked about what we should make for dinner. Sure, that makes sense. We settled on chicken piccata, roasted potatoes and green beans, a favorite in the Honig household. By the time we were ready to go shopping for ingredients, we were shopping for ten people. 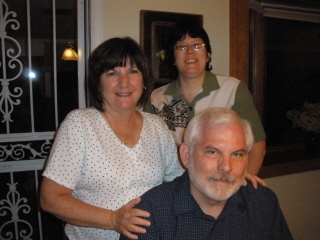 Liz, Janet and I were like a well-oiled machine. You would have thought we cooked together every night. Dinner was delicious. 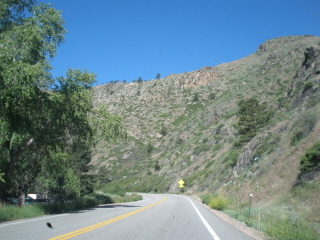 On Saturday morning, we started the drive to the mountains. 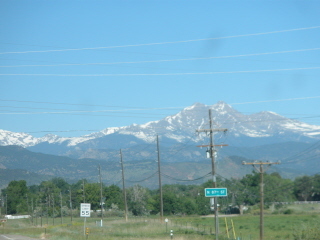 It's amazing to see snow on the mountains during the summer. The wool market was a bit different than the fiber festival we went to in Rhinebeck last year. 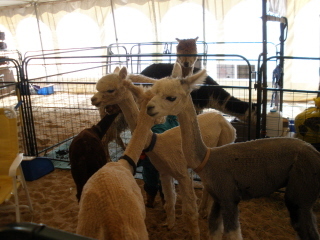 This had more spinning fiber than yarn for sale and also quite a few animals for sale, particularly alpaca and llama. 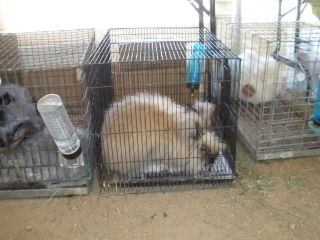 This little rabbit was for sale. He (or she) was the strangest rabbit I've ever seen. It didn't have the floppy-looking ears I'm familiar with. Of course, this rabbit wouldn't cooperate with picture taking and dropped its head every time I snapped. I can't tell alpacas and llamas apart. They're all cute, though, and expensive! Also, the sheep tent was extremely noisy with the sheep expressing their opinions and complaints. At least that's what it sounds like. 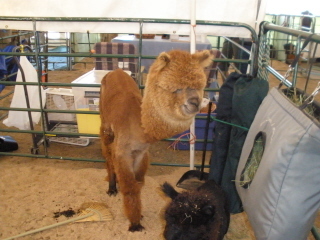 The alpaca and llama are quiet and appear to be quite docile. Of course, I didn't try to pet them! This little guy was shorn of his fleece...all except his head. They really are thin when their fleece is gone. 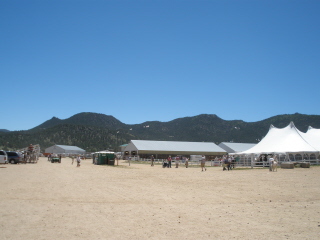 The tents with the mountains behind. 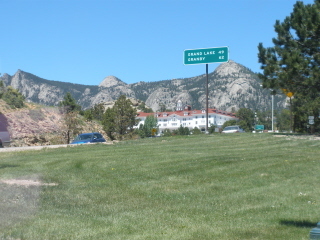 Another attraction in Estes Park is this hotel. This is where the movie The Shining was filmed. Imagine staying there. After I shopped to my heart's content, we went into town and had lunch. 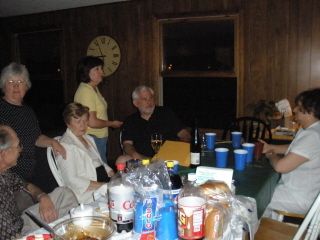 Then it was back to Liz's house for another dinner, this time a barbecue. 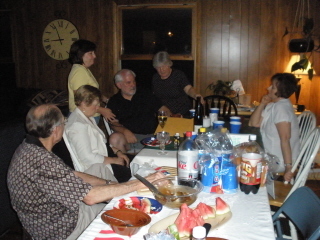 On Sunday, Janet and I had dinner at cousin Bill's house, where I met Bill and Helen Mary's grandchildren. 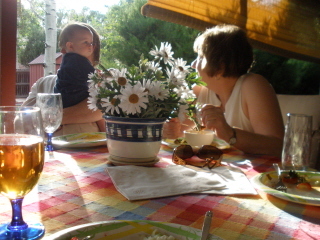 Here's little Josh and Helen Mary in the evening sun. 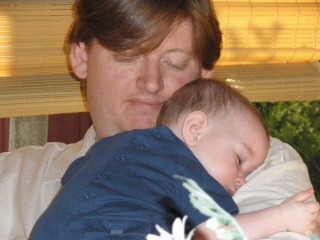 Josh napping on his Dad's shoulder. 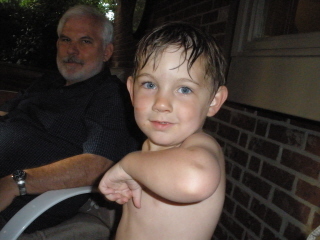 Josh's big brother, Jackson, shows me his muscles. 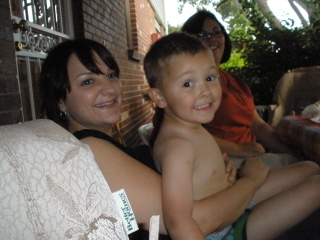 And their cousin, Johnny, sits on his Mom's lap. On Monday, we visited Delia at her business. She is co-owner of a Curves. 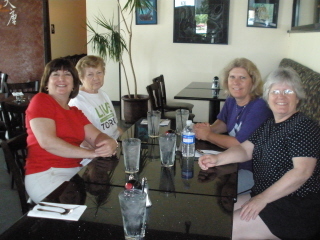 We did half a circuit and then went to lunch. 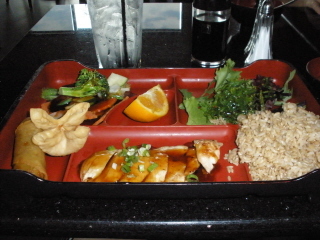 I was so impressed with the presentation of my chicken teriyaki that I just had to take a picture. I also needed a picture to show Bill. Let's face it, this wouldn't fill his eye tooth! It was delicious, though. 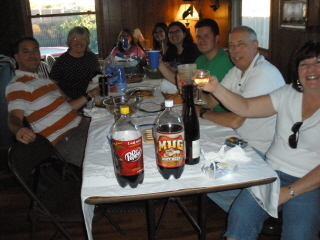 I came home on Monday and since then, we've been pretty much in a holding pattern. Last Friday, we had two installers here for NINE AND A HALF HOURS installing a new air conditioning/furnace system. Sounds good, right? Well, here's the kicker. It doesn't work. It needs a new circuit board, whatever that is, and we've been waiting for it to be delivered. We thought it would be here today but no luck. I'm keeping fingers crossed for tomorrow. We are so spoiled. 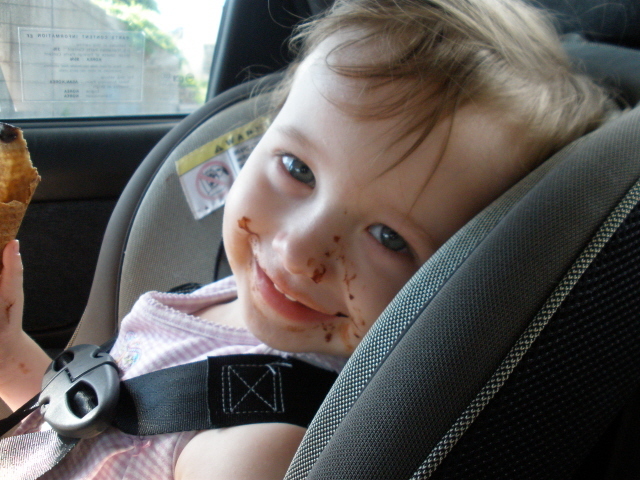 Yesterday, Bill and I went to Friendly's with Kelly and Lorelai. Lorelai had a cheese quesadilla and a cone head sundae for dessert. She enjoyed it so much, it shows on her face. Email sized and not web sized! So that's enough of an update for tonight. I'm going to sleep and dream about air conditioners...or about circuit boards, one or the other. I can't even remember when I started this but as of today, it is finished! The best thing is that it fits well. 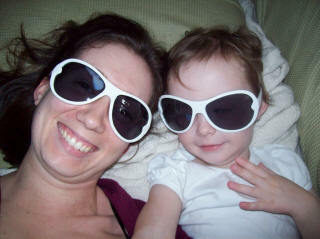 Silliness courtesy of white sunglasses from the $1 section of the Target store. In English class, my student is reading Romeo and Juliet. He's a good student and likes to read so he told me yesterday he'd finished reading the play over the weekend. He said, "It ended weird". I asked why and he said, "Well, Romeo threatens to beat up his servant, then he kills Paris, then he poisons himself, then Juliet stabs herself....and their parents don't even seem all that upset." I'm here! Are you amazed? Ok, May was pathetic, just pathetic. One post? I can do better than that. And to top it off, by missing the first of May, I missed my opportunity to sing the immortal song from the show Camelot, "Tra la, it's May, the lusty month of May..." For June, my only alternative is "June is busting out all over!" Hmm, no comparison. One reason for my negligence here is the time-sucking monster that is ravelry.com. It's an online knitting community. Think of it as Facebook for knitters, as one of my Sunday knitting companions describes it. It's still in beta-testing now so you have to request an invitation, which is as easy as sending an email. Once you become a part of it, it becomes more and more difficult to resist browsing for patterns, yarn, designers and such. And then there are the forums. On one forum for Long Island Knitters, I found a post about a knitting group meeting right in my hometown on Sunday afternoons. These informal little meetings have become such an important part of my week. The companionship is one thing but the wealth of knowledge and information here is quite amazing. Lorelai is growing and changing every day. She's just so funny. She recently asked me, "Nana, you have glasses?" I said yes and she said, "You look fabulous." I asked her the other day if she was going to do peepees in the potty soon and she looked at me and said, "Nope." socks dyed with Wilton cake decorating food color. Did I show you these yet? I can't remember. I used royal blue but it became various shades of blues and purple. Not what I intended but pretty just the same. If anyone asks me how I did that, I can just say...I don't know! I like it, though. 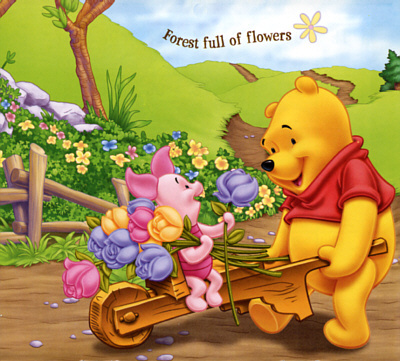 Isn't this cute? 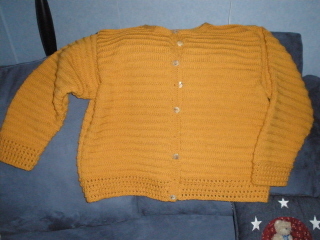 It's from a kit I bought last year at The Yarn Company in NYC. 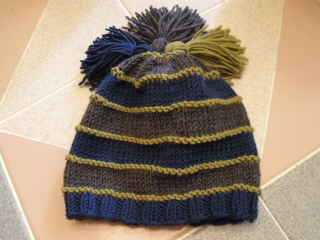 This little hat is for Janet's grandson, expected this August. And more socks. These are for Bill. 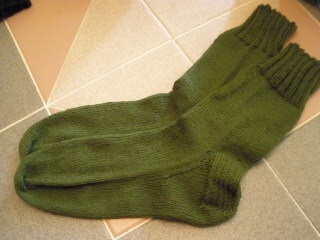 I used the same pattern I used for the blue wool socks, the "Man's Sock" pattern. This time, I shortened the leg to eight inches by request. These are made with Knit Picks Risata, a cotton and wool blend yarn. Bill requested warm weather socks. 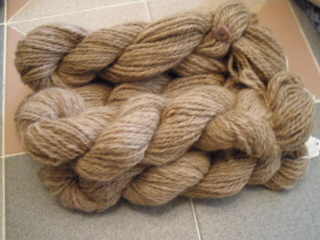 I like the yarn, it's nice to work with and like the Essential yarn, it's machine wash and dry. 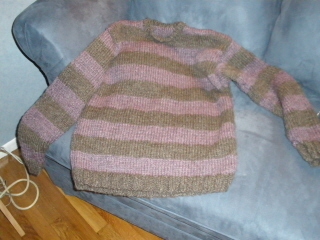 my first handspun handknit sweater. The colors don't show up well in this picture at all. 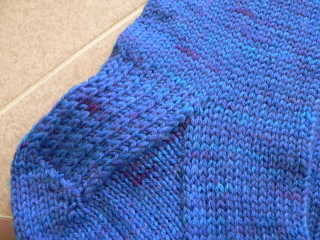 After I've blocked it, I will take some pictures in natural light to show the colors. It's way too warm out now to try it on but I can wait. I'm just delighted with it! 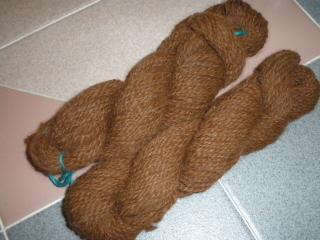 Wool and alpaca blend. I got this from Tabbethia at spin guild. I love this fiber. It practically spins itself. This is actually a better representation of the color, a caramel sort of color. Alpaca. Also from Tabbethia. Also absolutely delightful to spin. 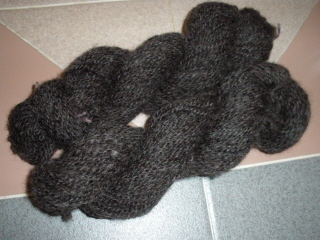 This is black shetland. 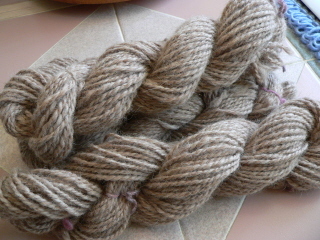 I bought this fiber last year at Rhinebeck before I'd even bought my first wheel. Quite a leap of faith, wouldn't you say? It's beautiful and I have lots of it left. Just a couple of weeks and I'm off for the summer. I didn't intend to work this year but I got back into the swing of things quickly enough. Working with this student was such a pleasure, I didn't find myself counting the days like I usually do. Still, it will be nice to be off again.